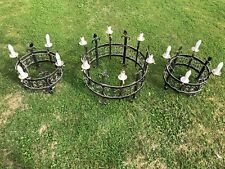 Set of 3 chandeliers found in a chapel that dates back to the 1700’s and recorded in the doomsday book. They are in a used condition. Once used as a cable holder these have been modified to hold bulbs and be used for modern electrics (however not sure when). These are beautiful pieces especially if you want a traditional statement in your home. VICTORIAN LARGE OWL OIL LAMP BASE, CONDITION CHIP TO RIM AND FACE, NO MARKS 26. Antique Victorian Heavy Wrought Iron Floor Lamp Converted To Electric. A beautiful Victorian Heavy Wrought Iron Floor Lamp. It has been converted from an oil lamp to full electric. It has beautiful gilt flower/ leaf design. Brass lamp has a few dinks and solder but overall the whole thing is in great condition for It's age. Vintage Rembrandt Lamp Co. Cast Iron figural Devil Face Piano/Desk/Writing Lamp with original shade. The cast iron base is in good condition. The wire frame shade has a tear in the old fabric - you take the fabric off & use the wire skeleton frame alone (which I think would look very cool especially with a Edison bulb) or have the frame re-covered. Good working condition. 10 1/2” tall, 5 5/8” diameter base. Marked on the base. Uses one standard base bulb. Please see photos and ask any questions. Thank you for Looking!!! Fine antique French gothic revival gilt bronze cherub lamp. The lamp has been rewired and has a pull chain socket with a fancy faux pearl pull on the end of the chain. The wire is silk covered cloth cord. Antique Winged Griffin Cast Iron 26" Lamp - Unusual Trio of Griffins. Each cast iron winged Griffin is 3" tall and on a 2-1/2" pedestal. Unusual Gothic kind of style. It'svery seldom to even find these anymore. Electrify your own castle with a single designer resin work of art or with several mounted to line a corridor. Our wall torchiere features an in-line switch and accepts your 40-watt bulb. 8"Wx9"Dx25"H. 6 lbs. Antique 19th C. Victorian Wall Sconce Bracket with Removable Oil Lamp P&A Mfg. This is a recent Estate find. This is a Rare Early Original Antique Victorian Ornate Wall Sconce Bracket with Removable Oil Lamp, made by P&A Mfg. Co. This Lamp is Complete with Lamp Body, Clear Glass Chimney, Burner and Wick. GLOBE IS 6 " TALL. LAMP IS 12 " TALL. This is lamp #1. This lamp is in perfect working condition. This lamp holds 6 bulbs. Two bulbs are on the top and 4 bulbs are around the center area. There are no light bulbs included with this lamp. Beautiful classic Gothic Rams Head Lamp. 21" to base of socket. Tripod Material : Steel & Aluminum. Tripod Finish : Nickel Finish. Shade Finish : Pewter Finish. Type : Floor Lamp/Corner Light. Great mid century modern Spanish revival or gothic table lamp. Lamp is metal, probably wrought iron. It is black with blue/green accent color. In original working condition. See photos for condition. Measures approximately 36 inches tall and 9 inches across base. It takes 2 standard bulbs with 2 pull chains. The only markings I found is “England” on the shade. This is lamp #1. This lamp has a silver color finish. There are Intricate Designs throughout this entire lamp. This lamp is in perfect working condition. There is no shade included with this lamp. The fitter opening will house up to a 3.25" O.D. globe. Suited for outdoor mounting as it also states that on the mounting plate. Below is a link for the globes that were installed with these. Sandblasted & Rustoleum Painted. This is lamp #2. This lamp is in perfect working condition. This lamp holds 6 bulbs. Two bulbs are on the top and 4 bulbs are around the center area. There are no light bulbs included with this lamp. Overall great condition. The other one works perfectly. They have what looks like original mottled grayish silver finish and possibly the original finish. Missing a small amount of finish here and there. This is lamp #2. This lamp has a gold color finish. There are Intricate Designs throughout this entire lamp. This lamp is in perfect working condition. There is no shade included with this lamp. It is in good condition with no breaks, bends, or repairs present. Excellent working order. lamp is embellished with a smokey diamond shape crystal glass. The lower diamond has a tiny little chip under it; hardly noticeable. Three way switch for upper bulb and one-way switch for the candelabra. Cast Iron with Slag Glass. wonderfully designed gothic lamp. fabulous early 1900s era lamp. Antique Arts & Crafts Light. original mounting bracket. bracket extends approx 7 1/2", 4" wide at mount. wear associated with age and use. This is a recent Estate find. This is a Rare Early Original Antique Pedestal Glass Victorian Banquet Oil Kerosene Lamp. The Burner Assembly is Brass Eagle Burner. This is Complete with Clear Glass Chimney. Nicely to work and sculptured. antique old french table lamp oil Brass. Antique 19c Bradley Hubbard Piano Floor Oil Lamp / Iron Gothic / Painted 11" Floral Globe. This lamp Holds 4 Candles. This is a working lamp as shown in the first photograph. I am unsure of the exact material that the lamp was made from. It has a Unique Design and Look. The lamp is 9 and 1/4" across. Beautiful gold cylinder holed defuser in the center of this light makes it pop! The lamp in general has a cool unique design with amazing curves. Everything else on this lamp is original. Has a pull chain at the bottom for turning on/off. It is now for sale and currently awaiting new owner. CENTURY KEROSENE LAMP IN GOTHIC STYLE. THE PERIOD DARK RUBY RED ACID ETCHED GLASS SHADE IS A WORK OF ART BY ITSELF. THE GLASS FONT IS SEALED ON THE INSIDE (NOT VISIBLE) WITH EPOXY TO HOLD LIQUID. Vtg Painted Gold Green Torchiere Lamp Hollywood Regency Rembrandt? This lamp has a Unique Design and a Gothic Look to it. This lamp is in perfect working condition. This Is Not A 100% Bronze Statue. This Piece Is Made With Cold Cast Bronze. Cold cast bronze is a relatively new material which has been developed over the last 20 years or so. What is Cold Cast Bronze?. Pair of early 20th century double-arm sconces. Could be Hubbard or Handel. Each fixture is marked on back "B-12". No warranty is made that any watch is in working condition or without defects, restorations, or working parts. HERE IS A NICE BRONZE CHANDELIER. Asian red bronze 4 demon table lamp, of unknown age and origin. Works perfectly. HERE IS A VERY UNIQUE HEAVY PEWTER GOTHIC FILIGREE TRIPOD BASE FLOOR LAMP WITH A LONG CANDLE DRIP TOP. IT IS VERY HEAVY. IT HAS BEEN REWIRED. THE BASE IS 11.5" ACROSS. FREE Trial! 3 piece beautiful vintage lamps set. One swag/ hanging lamp. 2 table lamps with shades. 56 inches tall they stand. Lights in bottom as well. One small red glass panel missing from swag lamp. (Photo shown) All in working order and a little dust thrown in for free. The flickering candlelight of our Castle Vecchio floor candelabra! Simple assembly required. Candles not included. 29½"Wx15"Dx59"H. 8 lbs. ANTIQUE LARGE UNIQUE PULL STRING GOTHIC STYLE TABLE LAMP.